As you learn how to draw hands, a little knowledge of how the hand is formed will help you avoid common mistakes when youlearn how to draw hands. Great artists have been studying anatomy since at least the Renaissance. They used their understanding of human anatomy to make sure that the figures they painted appeared convincing. An artist doesn't need to know all the details of the inner structure of the body, however. 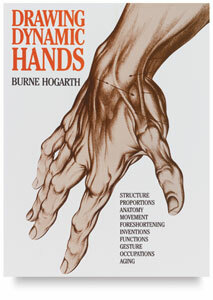 All you need to worry about right now are the major bones and muscles of the hand, how they are arranged, and how that affects the appearance. The phalanges that form your fingers. A simple rule of thumb is that the length of the middle finger is the same as the length of the metacarpals. 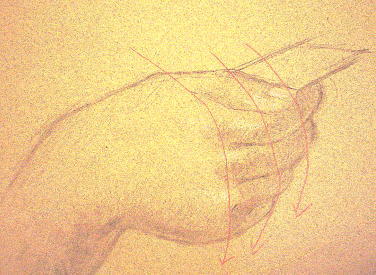 Of course, there is a lot of individual variation, but if you keep this in mind, it will help you draw the fingers and palm with the correct proportions. 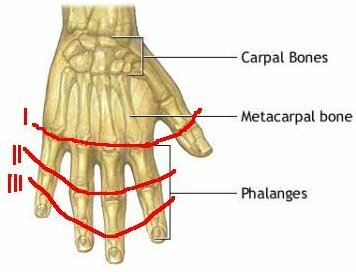 A crucial but often overlooked point is that if you draw a line connecting the four joints (the knuckles) above carpals, it will curve. If you do the same thing for the second set of knuckles, you will see it curves as well. If you draw a line between the farthest joints on your fingers, you will see that it has the most curvature of all. Remember this relationship between the joint positions; it will help you avoid drawing hands that look like bunches of bananas. So if you catch yourself drawing the fingers sticking out in a straight line from the palm, and they are all the same length, you know are not drawing correctly. There are hardly any muscles in the hand. What you see underneath the skin are mostly bones and tendons. The tendons allow the muscles of the forearms to move the fingers. There are two muscles in the palm of your hand: the thumb flexor and the little finger flexor. The rest of the palm of your hand is just bone, tendon, and “padding” to protect your joints. Don't worry about learning the name of every nerve and blood vessel, but learning a bit of hand anatomy can really help you achieve a realistic look as you learn how to draw a hand. Keeping the mechanics of the body in mind as you paint and draw will help you avoid many common mistakes.